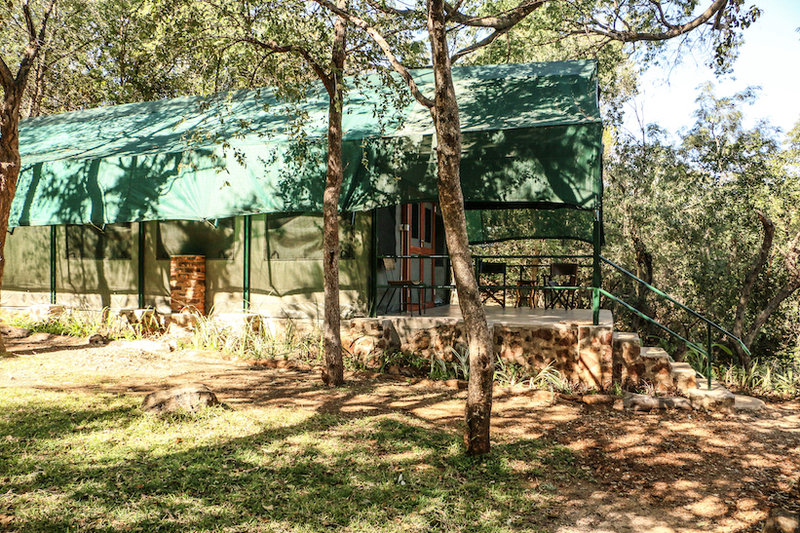 Our classic tented Safari Camp, built on a rocky hillside, offers a delightful oasis of green lawns, shaded tents with private bathrooms, a lovely swimming pool, deep thatched rooflines and a superb wooden deck overlooking a waterhole where wildlife comes to drink. Our daily rate is inclusive of excellent food and drinks and attentive service to make your stay a memorable one. 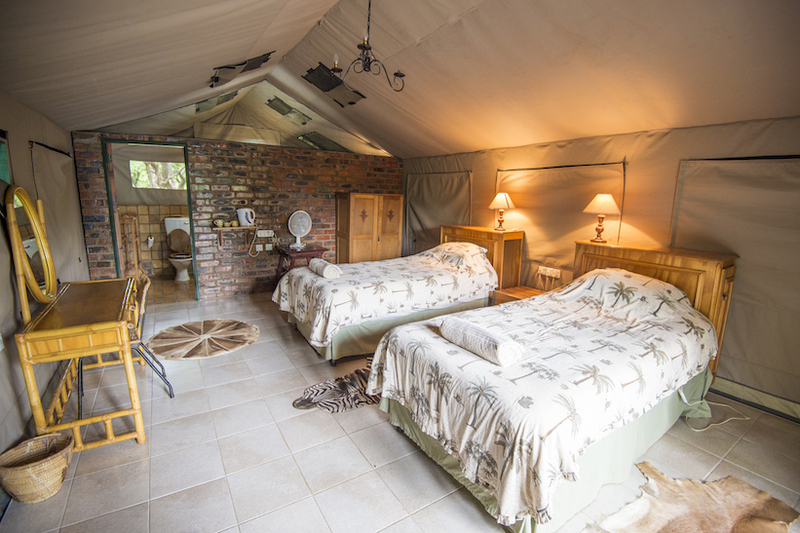 Our camp can comfortably sleep up to ten guests with additional space for PH’s and cameramen. 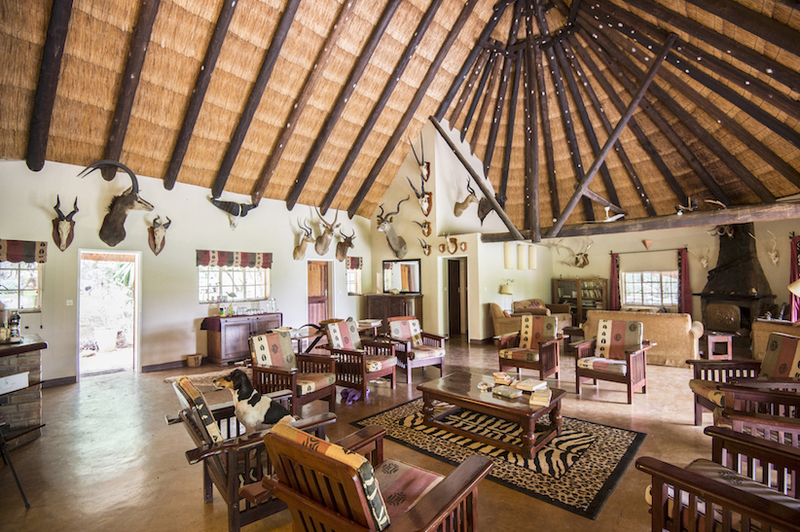 Enjoy classic, golden era safari style living! 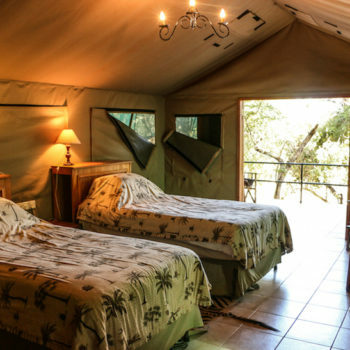 Our spacious ‘Meru’ style tents are furnished with extra length, 3/4 size quality beds; and private attached bathroom with running water and flush toilets. 220v electricity is provided in each tent with multi-way adaptors. Hairdryers are available on request, and 110v shaver plugs are installed in the bathroom. 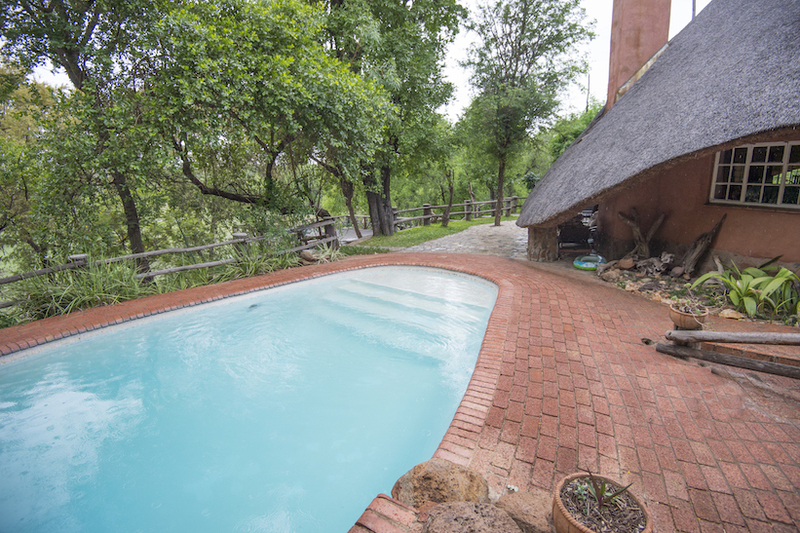 Our camp includes a swimming pool and a large and comfortable dining / living area with a fireplace. 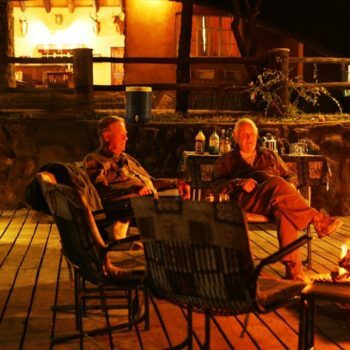 Both look out over a large, teak wood viewing deck where you can sit around the fire at night. 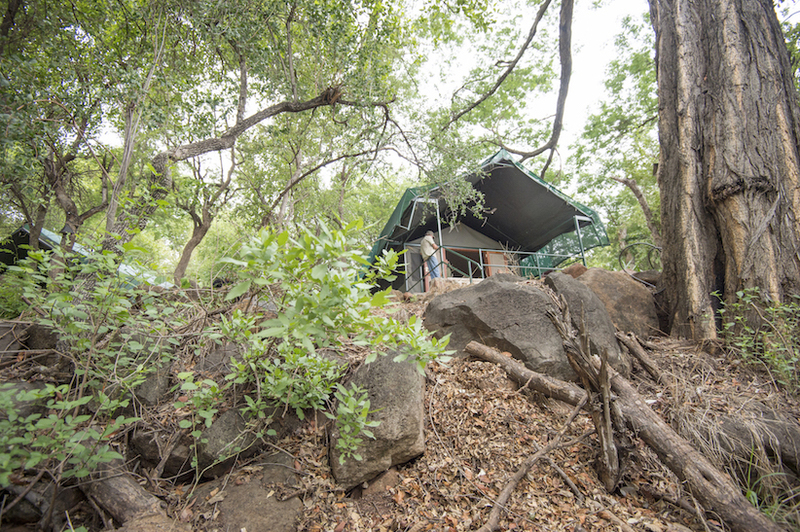 During the dry season the waterhole in front of the camp is a busy thoroughfare of wildlife. 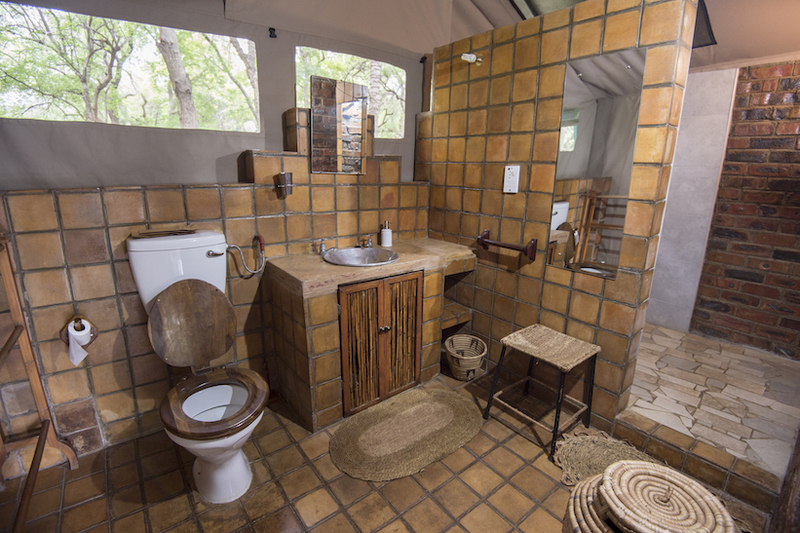 The camp gardens are inundated with bushbuck, warthog, kudu and mongooses. Enjoy watching them while you relax in camp. 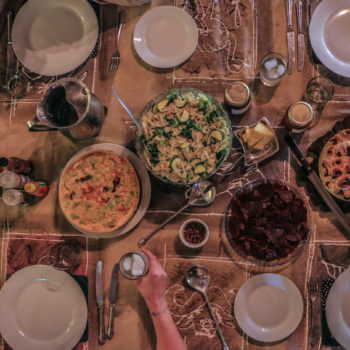 At Rosslyn Safaris, we strive to serve home grown or locally sourced organic foods. Venison is the most commonly served meat, and we’ll also aim to serve meat from the animal that you’ve hunted during the day. Organic duck, lamb and pork may also be served – a real plethora of tasty food! Not only do we have our very own small dairy herd providing fresh milk, and our own fresh chicken eggs each day; but we also make all our own jams, jellies, peanut butter, hot sauces and pickles. We’re here to make sure no one goes hungry, so vegetarians and other dietary needs are easily catered for. Just let us know your requirements and we’ll happily accommodate you!